Before we moved into our house, we spent many a morning, noon, and night over here painting. On one such occasion, we met one of our new neighbors who informed us about the "state of affairs" in our little corner of the city. 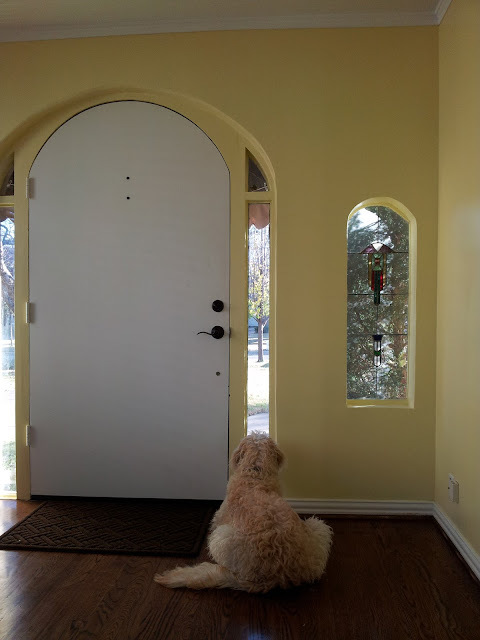 We were told that our neighborhood has been home to a few burglaries, and potential crooks had been known to drive by jiggling door handles in the middle of the night. The sweet treat to follow that mouthful was to not leave our dog in the backyard because he could be stolen for bait in a dog fight. We all know what a pretty boy Milt is, so I can only imagine. Jeff and I, an enthusiastic, young couple wielding paintbrushes, slumped down a few inches and our grins turned to frowns. News of the lack of security is enough to dampen one's spirits for not just the day but weeks and months following. This is why I insist that we do not gate the Milt into a certain portion of the house on days when he is left home. He is our first line of defense, and it is imperative that he has free movement between the front and the backdoor, so he can adequately guard both. He takes his job very, very seriously. Are we overreacting? Probably. Websites like this: 21 Things Your Burglar Won't Tell You fuel our fear too. Oh, and this one: 10 Things to Do When a Stranger Knocks on Your Door Remember to keep it all in perspective though, and please don't read these websites at nighttime when you are sitting by yourself because they are written from the burglar's point-of-view, and they will creep you out. When Milton found his deep, scary voice (his bark), as a mom I was proud, and now I am thrilled. When our doodle barks, I congratulate him and know that he is protecting his family around the clock. Coming from a police family I must tell you what my husband says. Big dogs voices scare burglars away more times than not. Burglars usually go to houses that would be the easiest targets. My husband would also recommend installing storm doors if you don't have them. Home robberies that Dan goes to often involve doors that the burglar can kick in easily... when you have a storm door it increases the amount of energy someone will have to spend to break into your house. I have to admit the talk about stealing dogs to be bait in a dog fight! SCARY! The best you can do is to be aware of your surrounding... make friends with neighbors so you can watch out for each other... and praise that Milton for his loud mean bark! Here, here! Storm doors are great for many reasons, this being at the top of the list. Looks like you may have difficulties finding one ready-made for the front but the rest of the house....I say go for it! Storm doors are also available with built in doggie doors with slide in locking face plates as well as additional locks for the door itself. Great call! Thank you so much for all the added information! I sincerely appreciate it. I never really understood the impact that a dog can have on a burglar, but I am happy that they have a big one! Our front door is thick, solid wood that no one is getting through, but the back of the house has four sets of French doors. These are the ones that make me nervous...! What does your husband say about those? We are going to upgrade our fence and have a security system as well. With all of the windows in that house, there really isn't a way to keep a potential intruder out. I like your comment about not making our house an "easy target". Looks like he's keeping a good eye on things. 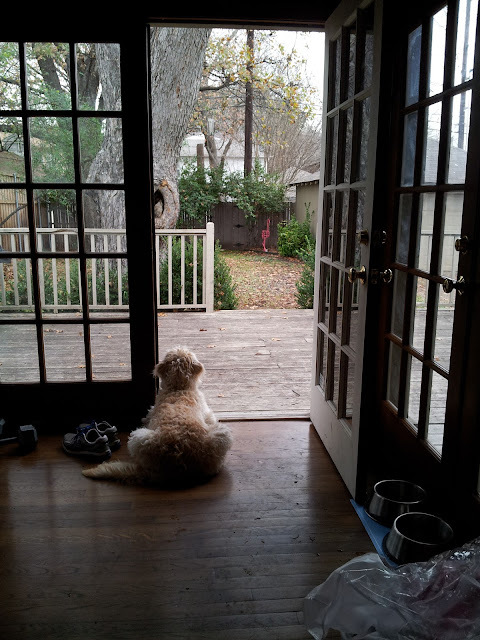 It's scary to hear about burglars in the neighborhood but I'm with you in that it's okay if the dog barks a bit, lets people know to move along, this place is mine. But....now I have to read the links you posted, maybe I can learn a thing or two from the bad guys. I didn't used to be frightened, hope this doesn't change things. I'll still watch scary movies when I'm home alone at night because I figure Michael Myers is still busy in Illinois and won't be making it to Florida any time soon. Weird thing - reading these sites I just remembered that I had someone come to my door less than a week ago. He looked like one of those high school/college kids selling magazines. Both the dogs raised a ruckus without me deterring them and when answering the door (I had a house full of guests so I wasn’t alone) I made a big show of holding back the large, barking dogs. 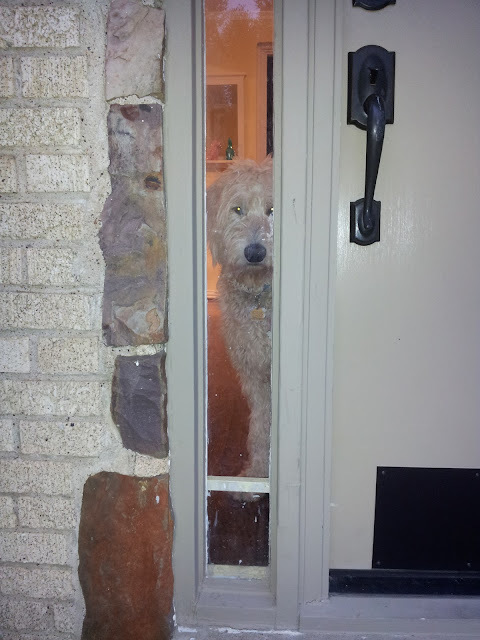 The young man didn’t stay at the door long; between my mean dogs and my mean self he was gone in a jiff. Of course it could have been that fact I answered my door in my pajamas and messy bed-head BUT one never knows! Crazy things like that do happen! I remember when I was younger, I let a young guy traveling with some religious group from California into our home, and my dad was livid at me saying he was probably casing the house. It was all really odd, and he did leave quickly. I was just so naive!